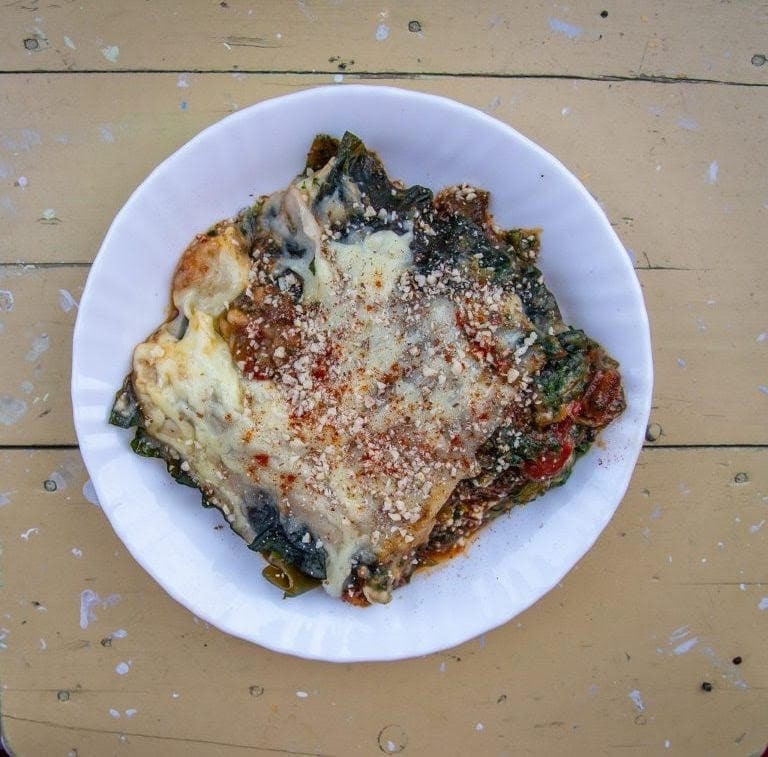 Sugar Kelp Lasagne - Lofoten Seaweed | From Lofoten, Weed Love. 1. Finely chop the onions and the garlic cloves and sauté in a pot with olive oil until golden (15-20 minutes). 2. Add oregano, dried basil, smoked paprika, cinnamon, salt and pepper to taste and sauté together for 1 more minute. 3. Add chopped tomatoes and sugar and let simmer for at least 20 minutes. 4. In the meantime, cut the champignons into thin stripes and fry in a pan with olive oil until well cooked. 6. Melt butter in a pot. Add flour and cook for 1-2 minutes or until it starts to turn slightly brown. 7. Add 700 ml of milk stirring constantly. Keep stirring until all the milk is well incorporated and the sauce starts to thicken, add a pinch of nutmeg and salt and pepper to taste. 8. Mix ¾ of the bechamel sauce with the spinach and champignon. Save the rest for later. 9. Boil the fresh sukkertare in salty water for 4-5 minutes, until they turn bright green and become soft. 10. Strain the seaweed strips and cut them to fit your oven tray. 11. Place a baking paper on your tray, cover it with some of the reserved béchamels and lay two sukkertare strips on top. 12. Cover the sukkertare with the spinach mixture and spread well. Next, add a layer of tomato sauce and cover with the next layer of sukkertare. 13. Repeat this process until you don’t have any spinach mixture left. Cover the last sukkertare strips with tomato sauce and the rest of the béchamel. Sprinkle some cheese on top. 14. Bake the lasagne in a pre-heated oven at 180ºC for 30-40 minutes, or until the cheese has melted and starts to brown. 15. Let it cool down for at least 15 minutes before cutting it. Sprinkle with some Simply Seaweed and oregano.